Kuriyama - UBK Polyurethane-Lined Abrasion-Resistant PVC Material Handling Hose - 4 in. X 100 ft. - OD: 4.76 in. Black HMW PVC flexible – provides sub-zero flexibility and light weight for easy handling...formulated with anti-static material. Polyurethane-lined abrasion-resistant PVC material handling hose for dry applications. • Smooth polyurethane lining - provides resistance to abrasion ... eliminates material build up. • Black HMW PVC flexible - provides sub-zero flexibility and light weight for easy handling ... formulated with static-dissipative compounds. 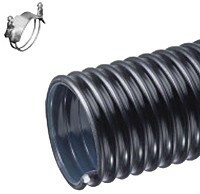 • Exposed black rigid PVC helix - abrasion-resistant... allows hose to slide easily ... easier to handle.